Auxiliary Bishop Octavio Cisneros was born in Las Villas, a province of Cuba, on July 19, 1945, the third of four children of Roberto Cisneros and Olga Lezcano, both now deceased. Shortly after his birth, his family moved to La Habana, where he was baptized in Our Lady Montserrat Church. The Piarist Fathers educated him as a youngster, and in October 1961, while a high school student, he came to the United States as a political refugee as part of Operation Peter Pan, a Catholic humanitarian effort that brought 14,000 unaccompanied minors to the U.S. from Cuba. Relocated to Marquette, Mich., he attended and graduated from St. Paul High School in Negaunee, Mich. He went on to St. Lawrence Minor Seminary in Mount Calvary, Wisc., where he earned an Associate Arts degree, and Niagara University, where he received a Bachelor’s degree. Bishop Cisneros’s first year of theology studies took place at DeSales School of Theology in Washington, and he completed his theological studies at the Immaculate Conception Seminary, Huntington, L.I., earning a Master’s in divinity degree. He was ordained to the priesthood by Bishop Francis J. Mugavero on May 29, 1971. For the first eight years of his priesthood, he served as parochial vicar at St. Michael’s Church, Sunset Park. In 1979 he was named diocesan coordinator of the Hispanic Apostolate and eight years later was appointed pastor of Our Lady of Sorrows Church in Corona. His subsequent appointments were as an Episcopal, or Territorial, Vicar in the Brooklyn East Vicariate and as rector of Cathedral Seminary Residence in Douglaston. He was named a Prelate of Honor by Pope John Paul II in 1988. 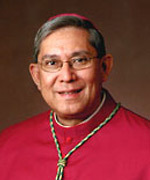 Bishop Cisneros’s activities have included associations with the Northeast Catholic Center for Hispanics, the “Instituto Nacional Hispano de Liturgia,” the board of governors of Immaculate Conception Seminary, the Bishop’s Committee on the Liturgy, the Pastors’ Advisory Committee and the Conference of Diocesan Directors for the Spanish Apostolate, which he served as president. He serves as vice-postulator of the Cause for Canonization of the Servant of God Felix Varela, a Cuban priest who served in New York for almost 30 years, ministering to Irish immigrants in the early part of the 19th century. The bishop is a founding member and president of the Felix Varela Foundation.